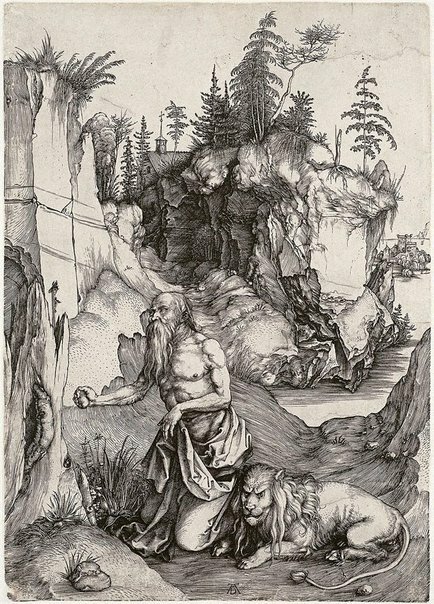 Dürer made five prints of St Jerome during the course of his career. Jerome is one of the four Doctors of the Latin Church and produced the Latin vulgate version of the Bible. Earlier in his life he lived as a penitent and hermit in the desert, as he is shown here. The landscape setting, however, is inspired by Dürer's travels through the Alps and his studies of quarries and cliffs around Nuremberg. Signed l.c, [incised plate] "AD [artist's monogram]". Not dated. Nicolas Draffin, Piety and Paganism , 'Introduction', pg. 3-5, Sydney, 1991, 4, 13. Portrait of a Gallery , 'Prints & Drawings', pg. 115-122, Sydney, 1984, 115 (illus. ).